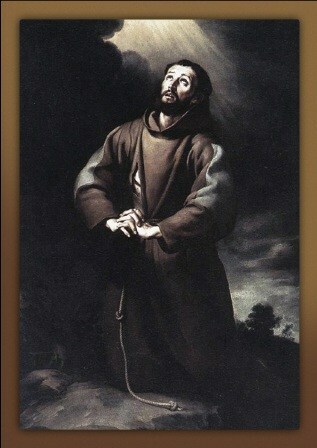 As a young man St. Francis had a great enthusiasm for life. He was passionate and poetic. He reached out to others cheerfully and they enjoyed his company. He was always ready to laugh at himself, as one can do with their friends, and in this spirit of fraternity he was a rather boisterous leader of the youth of Assisi. He was naturally generous and his warmth reached out not only to his friends, but also to the poor. His father, Pietro Bernadone, was a wealthy Italian cloth merchant who was very proud of his riches and his sons', Francis and Angelo. His mother who was born in France was a loving and devout person. Everyone endearingly called her "Pica" a nick name. As the son of a wealthy family, Francis learned to enjoy life. His cheerfulness, love of fun and his pocket money, made him popular among the young people. With the encouragement of his father, Francis dreamed of becoming a noble knight who would accomplish fantastic deeds and bring honour to his family. He attended the church school of St. George and was no doubt entranced with the story of this saint who is one of the patron saints of knighthood. It was an age of chivalry and Francis too wanted to find his own dragons to slay. Finally when the cities of Assisi and Perugia went to war against each other, Francis had his chance at glory. The reality of war however, was not what he dreamed. The fierce fighting, vicious hatred, horrible mutilation and death were a shock to his spirit of nobility. Being captured and held as a hostage in a stinking dungeon held no glory, only insult, sickness and death for many of the soldiers. Francis himself came home very ill after his imprisonment and then, as he slowly returned to health, he began to yearn for a better purpose in life. In the months ahead he tried to put the feeling aside by taking up his old ways of enjoying himself with his friends. He was soon offered a chance to go to another war. This time it was to fight with the Papal army. Perhaps this was the chance he was waiting for, the purpose of his life. His father happily provided him with a splendid suit of armour. However, as they were setting out to join the army, Francis met a knight in very poor armour. With his usual impulsive generosity he insisted that the knight had more right to wear his beautiful armour than he did, because he himself had not yet won his spurs, sword and shield. That night as he lay down to sleep with the rest of the army under the stars, Francis had a very vivid dream. He was in a hall full of armour with coloured banners hanging from the walls. He heard a voice ask him, "Francis, who is it better to serve, the Master or the Servant?" He answered, "The Master". The voice then said, "Go back to Assisi and all this will be yours." It was such a powerful dream that Francis acted on it and went back home. However, it was quite some time before he heard the voice again. One day as he was praying in the little old church of San Damiano, the voice spoke to him again. This time it came right out of a large painted crucifix hanging on the wall. The voice said, "Francis, go repair my Church, which, as you see, is falling completely to ruin." Impulsively Francis rushed home, grabbed some expensive bales of his father's cloth, sold them and took the money to the priest of the church. When Pietro Bernadone heard about it he lost his temper completely and went searching for his son. Francis was so scared that he left St. Damiano and hid in a cave up in the woods. After about a month he got up enough courage and went back home to face his father. Pietro was so furious that he screamed at him, beat him, put chains on him and locked him in the cellar. However, while Pietro was out of the house Lady Pica set her son free. When Pietro arrived home, he upbraided her and then went searching for his son again. In the confrontation that followed, Francis gave back the money he had made on the cloth. Then before the bishop of Assisi, he even gave back to his father the clothes he was wearing. He declared that he no longer would call Pietro Bernadone his father, but would say, "Our Father who is in heaven." Soon after, Francis could be seen trying to rebuild the little church of San Damiano all by himself. He would go into the town to beg for food and stones. He worked cheerfully at this until he had finished. Then he began to work on another little church dedicated to Our Lady of the Angels. During this time he wore a habit with a belt, had shoes and carried a staff like a hermit. On the feast of St. Matthias he heard a reading from the Gospel of St. Luke (Lk.10:4ff.). It inspired him to live a life based on the Gospel. In his desire to imitate Our Lord Jesus as closely as possible, he removed his hermits garb and making a habit in the form of a cross he tied himself to it with a cord. There and then, he dedicated himself to follow in the Lord's footprints as closely as possible. His relationship with the Father, the Creator. His relationship with Christ crucified, his Lord and Brother. His relationship with the Church, the mystical Body of Christ. In his relationship with God the Father -- the Creator, Francis saw clearly that we are all God's children; that we are all brothers and sisters. He saw that human life was sacred from its beginning to its end. His vision of fraternity extended to all creation and he began to call the birds, the animals, the sun, the moon, fire and water, indeed all things "brother" and "sister". He became courteous and concerned even for tiny creatures like crickets and earthworms. Later, towards the end of his life, when he had become almost blind, he composed a splendid hymn called "The Canticle of the Creatures" to praise God through all his creation. When Francis finished rebuilding the chapel of Our Lady of the Angels, he began to repair a third little church. As he began to rebuild this chapel dedicated to St. Peter, whom Our Lord called "the rock" he began to understand that the Church is made up of "living stones" and that he was being called to restore it by preaching again the Gospel of Jesus Christ to everyone. With the wisdom he had gained in building stone by stone, he was now prepared to care for people one by one and share with them the "Good News" of the Gospel. All alone he began to go from place to place, sleeping on the ground, begging for food, and preaching about the Father's loving care and the sacrifice of the crucified Christ. He urged everyone to repent and turn back to the way of the Lord. He tried to convince the rich to live a simpler lifestyle and care for the poor, who were their brothers and sisters in Christ. He went among the poor and sick and he even went and cared for the lepers who used to make him sick just to think about them. He treated them as if they were his own brothers and cared for them tenderly. He cheered them with his bright hope and gave them back their dignity by loving them and sharing with them the love of God. He was not a forceful speaker like St. Anthony, who joined him later on, but he spoke gently and sincerely and his genuine love for others touched their hearts because he was prepared to share his life with them. Francis' joyfulness showed the love of God, his gentleness became the kind touch of God, his compassion was like the eyes of God seeing all, his good humor was like the heart of God, intimate and secure. All this was contagious and awoke true humanity in others and they began to reach out to each other and care for each other. Francis became, for those he met, an instrument of God's pure grace. Soon others attracted by him and his way of life began to join him, living in poverty and traveling with him, preaching the Good News. So many started to come and join him that he had to write a Rule of Life for them based on the Gospel. He did this because, although he and his small band of friars were influencing many people to follow the poor Christ, and to love the Church, their way of life was looked upon by some with concern. At that time there were groups of heretics who were causing great confusion among the people. Because Francis did not want his friars confused with the heretics, he took his Rule of Life, which he had written down in few and simple words, to Pope Innocent III to assure him that all of his friars would respect and obey the Church. The Pope then gave Francis approval for his way of life. Francis wanted more than anything else to become like Jesus. He loved his Lord so much, that he tried to be like him as much as he could. He tried to be poor because Jesus was poor and had nothing. He tried to be humble because Christ lowered himself to become human like us. He was compassionate to those who suffered because he knew Christ crucified. He knew that Jesus had been mocked and called names and spat upon. So he learned to laugh at himself and not take the negative reactions of people too seriously. This good sense of humor and true compassion often won over even the most difficult people. With his inner vision fixed clearly on Jesus, the crucified Christ, Francis used to sing:" So great the good I have in sight, that every pain I count delight"
Two years before his death, while he was at prayer in the woods on the top of Mt. Alverna, he looked out over the cliff towards the rising sun, and saw an Angelic Seraph coming towards him in a vision of the crucified. On the mountain, Francis had been praying to God, asking him if it were possible for him to feel the love that Christ felt for us that made him accept the sufferings of the cross. At the appearance of the Seraph, Francis fell into an ecstasy. When he came back to himself, he found that he was in great pain and bleeding from his hands, feet and side, as if he were nailed to a cross. He was overcome with love and grief for Jesus Crucified. Francis tried to keep the marks on his poor body secret, but because others had to care for him more and more, the news of this unheard of mystical experience began to spread and his fame grew. When he was dying, he asked to be laid on the bare ground out of humility. He understood clearly that compared to the glory of God he was only worthless dust and ashes. If he had any merit it was because the Holy Spirit had blown it to life for a brief moment. Before he died Francis also asked that bread be brought and when he had blessed it and given it to his brothers as a sign of his love, he asked that the story of the Last Supper be read from St. John's Gospel. After that he kept urging the friars to sing the praises of God. Finally, singing Psalm 141, he went home to God. St. Francis was canonized on the 16th of July 1228, within two years of his death. In 1939 he was proclaimed patron of Italy and in 1980 he was proclaimed the patron of ecology.